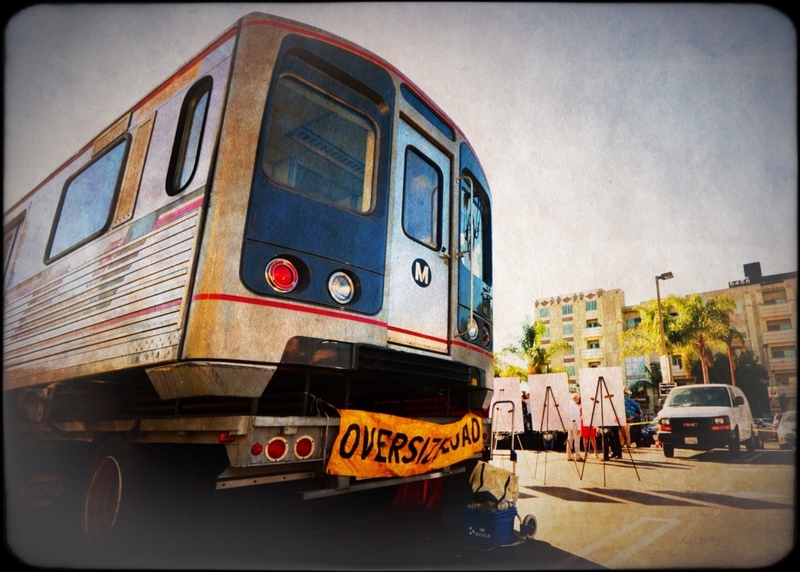 Art of Transit: A mockup of a subway car at the Westside Subway Extension's utility relocation event at Wilshire & La Brea last week. Photo by Steve Hymon/Metro. We can't add much more roadway, but as the population grows, we'd be wise to find ways to more efficiently use what we've got while adding transit options and encouraging more carpooling. And that's the whole point of toll lanes. In theory, everyone benefits. The driver who chooses to pay a premium goes faster, but the driver who doesn't pay goes a little faster, too, for no extra charge. That's because as single-occupant vehicles and carpoolers are lured out of regular lanes and into the toll lanes, the volume is lowered in the regular lanes. Traffic has slowed a bit on the 110 since the Express Lanes opened a little over a week ago as people try to puzzle out what the signs mean, according to project manager Stephanie Wiggins. But once people get used to the new system, average speeds in the regular lanes should increase between 2 and 10 miles an hour, depending on various traffic conditions. That's what has happened in other parts of the country where this system is in operation. Details haven't been released but the agreement will allow design and construction of the bike path through Cheviot Hills to go forward. A Sacramento County judge on Friday denied a request to halt future construction of the bullet train in Madera County, where the tracks would bisect some farm properties. Farmers wanted the injunction against construction as part of their still-to-be-settled lawsuit against the California High-Speed Rail Authority over the adequacy of the environmental studies for the project. People are louder, too. They complain at length and in detail about their divorces or gallbladders a foot away from you in restaurants. A dreaded Amtrak type is the passenger who commences prattling on her cellphone the instant she sits down and doesn’t hang up until she gets to her stop, unable to bear an undistracted instant in her own company. People practice rap lyrics on the bus or the subway, barking doggerel along with their iPods as though they were alone in the shower. Respecting shared public space is becoming as quaintly archaic as tipping your hat to a lady, now that the concept of public space is as nearly extinct as hats, and ladies. Boom! Take that ladies! And hats! Melbourne Metro PSA: "Dumb Ways to Die"